1*Organizer of controls and tray for sofaA practical organizer of controls with tray for the sofa that will be very useful in your home. You simply have to place it on the arm of your sofa, and enjoy the comfort of always having at hand the controls of your TV and other appliances, or any other object that you want to have nearby while you are sitting and relaxed. 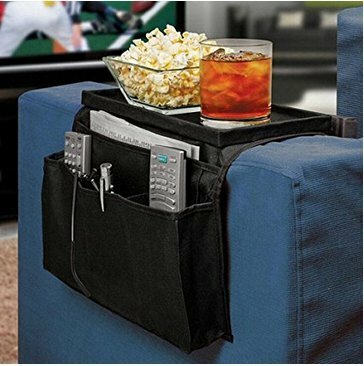 In addition, it has a kind of tray on top that you can use to place snacks, drinks, etc. This organizer of controls with tray has a modern and functional design, serves for any sofa and has been made in a flexible and resistant fabric. It has 6 side pockets to place the controls and other objects. The hanging sides measure 31 x 21 cm approx. each. The measures of the upper tray are 29 x 17 cm approx.